Crinkle cakes were a favourite childhood and this new recipe Cherry Chocolate Chip Crinkle Cakes rekindle those memories. I loved crinkle cakes as a child. We received a terrific nostalgic response from perfecting and posting our recipe for the Gumdrop version. We have been trying out new versions to share with you since then. These tender moist little cakes are terrific with just glacé cherries but as the kids suggested. “Everything’s better with chocolate chips” and I didn’t argue. 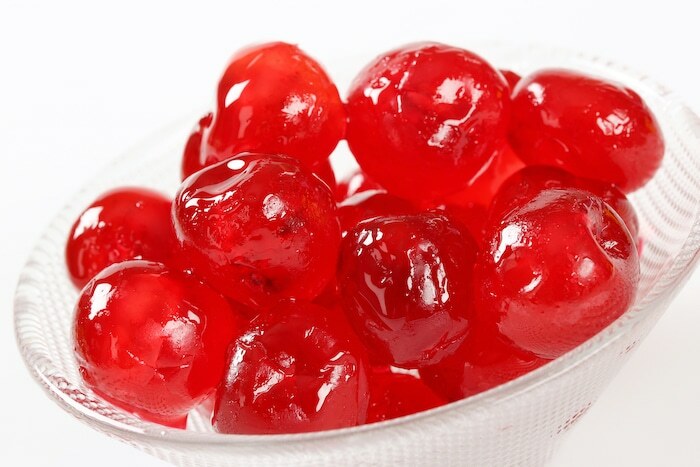 Red Glacé Cherries can easily be replaced with chopped fresh or frozen cherries if you like. I shared these with a few co-workers and they absolutely raved about them. What a perfect lunchbox treat. Dark 50% cocoa chocolate chips are my favourite in this recipe but you can use milk chocolate if you prefer. Like this Cherry Chocolate Chip Crinkle Cakes recipe? 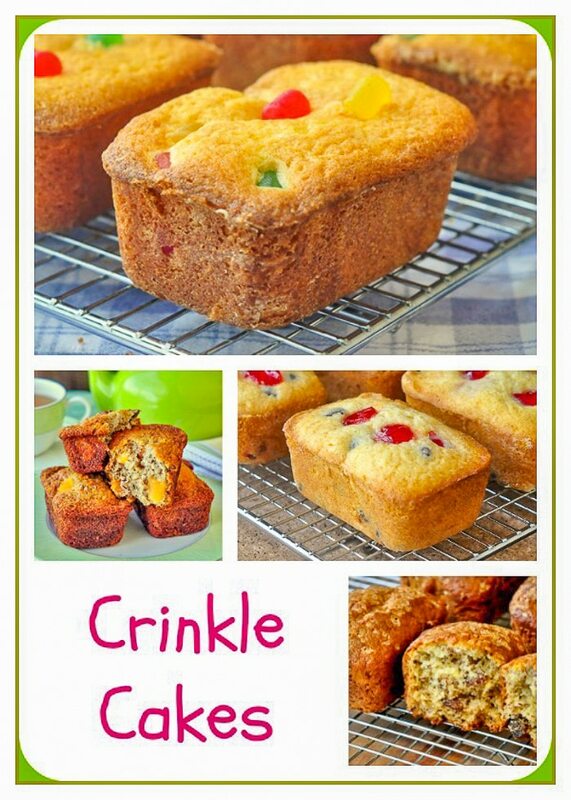 These little cakes make great lunchbox additions that kids and adults alike will love. Cream together the butter and sugar well. Add the eggs, one at a time, beating well after each addition until light and fluffy. Blend in the vanilla and lemon extracts. Sift together the cake flour and baking powder. 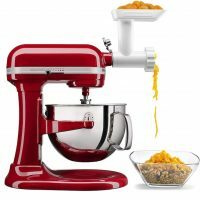 Fold dry ingredients into the creamed mixture alternately with the evaporated milk beginning and ending with the dry ingredients. Fold in the chopped cherries and chocolate chips. 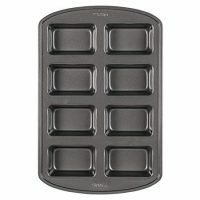 Bake in greased and floured mini loaf pans or in paper lined muffin tins. Bake at 325 degrees F for 25-30 minutes or until a toothpick inserted in the center comes out clean. Muffin sized cakes will take only about 15 to 20 minutes. Watch them carefully so they don't over bake. 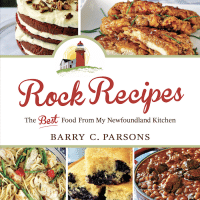 Hi Barry, I’m a new baker and this recipe looks wonderful!! My hubby loves partridge berry crinkles; if I were to use frozen berries rather than chocolate chips and cherries how much do you suggest using? And do you roll frozen berries in flour before using? Hi Robin, I’d use about 1 1/2 cups. No need to roll them in flour. A different Robin here……….do you have any info on why these are called “Crinkle Cakes”? It is an interesting name! Hello different Robin. The original bakery made version used crinkled paper liners like cupcake liners but rectangular. I think that’s where it comes from. i made the “gumdrop” recipe last night, very good !! Please Barry how much is your cup of flour in grams? Hi, I made the recipe using mixed fruit and they are delicious. Thank you. How many loaves does this recipe make? Depends on your pan size. Far smaller than that. It’s a single pan like a muffin pan. The cakes are about muffin sized. Just wondering if you have tried these using maybe chopped pecans instead of chocolate chips? 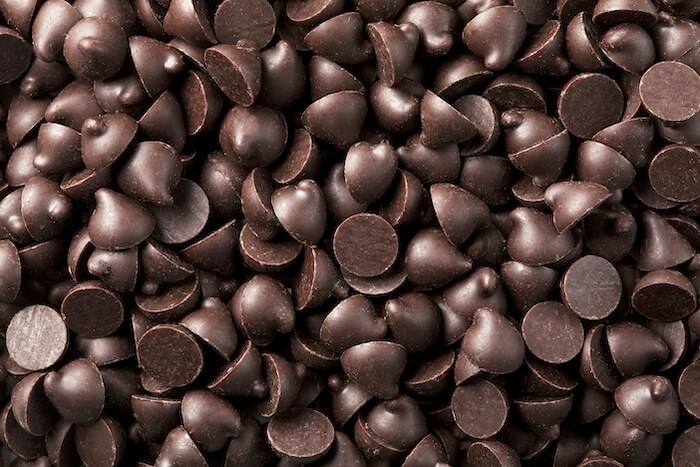 I’m not a fan of chocolate chips except in cookies.